The embattled restaurant chain postponed the deadline for director nominations as it enters its sixth month of a strategic review. Ruby Tuesday Inc. (RT quietly pushed back the deadline for shareholders to nominate dissident director candidates, a shift that comes as the embattled restaurant chain moved into the sixth month of an ongoing strategic review. The restaurant chain said in a release last month that it was postponing its annual meeting from December to Jan. 22 in light of the strategic review and that the deadline for investors to nominate dissident director candidates was pushed back from Sept. 7 to Oct. 23. Ruby Tuesday's said it does not anticipate any further postponements for its annual meeting, which is usually held in October. Nevertheless, the extended delay comes as activist investor Glenn Welling and his fund, Engaged Capital LLC, continue to own a 3.3% activist position. The allocation means that Welling, a frequent employer of boardroom battles, may be considering a director-election fight if the restaurant chain doesn't engage in some serious M&A activity in the not-too-distant future. 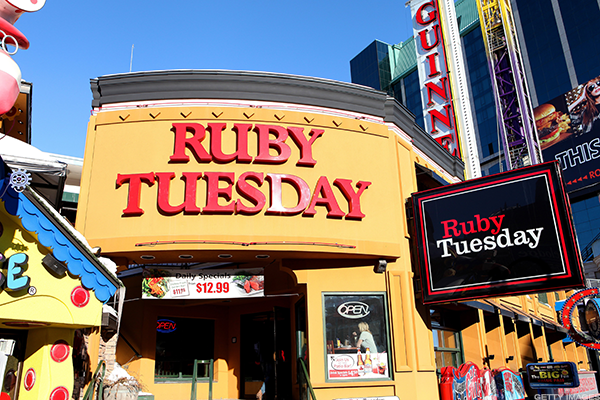 Ruby Tuesday, for its part, launched its strategic review in March. It's possible that Engaged could be pushing Ruby Tuesday to sell itself or its property. A lot of real estate still remains on the books, which is likely what is attracting activist investor attention. The company owns the land and buildings for 269 of the 543 company's owned and operated locations, according to an August securities filing. The chain has about 600 restaurants in the U.S. and internationally, of which 62 are franchised. The fund could also be urging Ruby Tuesday to drop its operating restaurant business and become a pure-play real estate company by converting itself into a REIT, with the goal of finding other high-paying tenants for its real estate locations. Alternatively, activist investors could put pressure the company to sell its real estate and lease it back. Another option would be to have a private equity firm buy the whole business and subsequently sell the land holdings to help pay for the acquisition. Some believe buyout shop Golden Gate Capital LP or another private equity firm could be interested, with that strategy in mind. The private equity firm acquired Red Lobster Seafood Restaurants in 2014 for $2.1 billion, and as part of that deal, it reached a $1.5 billion sale-leaseback agreement with American Realty Capital Properties Inc. for the chain's real estate. The proceeds from the real estate sale helped finance the Red Lobster acquisition. Golden Gate in January acquired Bob Evans Farms Inc., under pressure from activist investor Tom Sandell and Sandell Asset Management. Since then, the buyout shop has sold the real estate under about 55 locations to three REITs, including Four Corners Property Trust (FCPT - Get Report) . It's possible that FCPT could be interested in some of Ruby Tuesday's properties. Is a Boardroom Battle Next at UGG-Maker Deckers? John Gordon, a restaurant analyst at Pacific Management Consulting Group, said Ruby Tuesday is the weakest of all the publicly-traded casual dining firms. He doubts Golden Gate would want to buy Ruby Tuesday. In addition, he argues that the length of the review suggests that buyers aren't lining up. Ruby Tuesday is on the ropes. "Clearly they've been trying to sell the company but no one wants to buy it," Gordon said. "A greatly diminished brand [Ruby Tuesday] might be an anchor around their [Golden Gate] necks. I'm very skeptical about whether Golden Gate or any private equity firm would be interested in buying it." Gordon argues that potential buyers thinking about buying Ruby Tuesday may want to consider the fate of Macaroni Grill, another troubled chain that caused a lot of trouble for investors. Golden Gate acquired Macaroni Grill in 2008 for $131.5 million and sold it to Ignite Restaurant Group for $55 million. And Ignite Restaurant Group filed for bankruptcy earlier this year partly due to the unfortunate acquisition, Gordon said. "It was a falling knife that came down on them," he added. "Macaroni Grill didn't own any real estate while Ruby Tuesday has a lot of real estate. Nevertheless there are lots of parallels. The acquisition helped drive Ignite Group's descent into bankruptcy." Another option would be for the management of Ruby Tuesday to take the company private in a leveraged buyout, with the goal of reducing the business into a smaller, possibly franchised operation, that only kept restaurants operating in strong markets. "The share price is so low that such a move would get the company off of Wall Street and all the expense of being a public company," Gordon said. "Then they could conduct an orderly wind down, selling real estate, and wind up with an approximate 150 store business with some cash and geographic locations that work." Stephen Anderson, an analyst at Maxim Group LLC in New York, suggests that Ruby Tuesday could consider converting itself into a REIT, with the goal of closing down the restaurant chain, or a big chunk of it, and leasing out its locations. "It's been tough for them to generate positive EBITDA," Anderson said. "You have to question whether the restaurant operation company strategy works or whether it would be better as a real estate company." He said the type of buyer that might be interested in purchasing Ruby Tuesday is a value buyer who differs from those that could be considering a bid for Potbelly Corp. (PBPB - Get Report) , which launched a strategic review last month also under activist pressure. "There is a lot more demand for growth concepts than non-growth concepts," Anderson said. "Ruby Tuesday fits in the value buyer category because it has some real estate assets it can dispose of but it is in a more rapidly declining situation than other restaurant chains." He added that Potbelly fits better in the growth category, but it also has a number of locations it could franchise out to raise cash.